Here is a 35x41mm. steel and gold toned BUCHERER chronometer grade automatic winding 70’s watch that has just been serviced and running accurately. The dial is original and has taken on a vintage look from age. This steel case looks much better in person and will attract eyes due to the modest appearance. Bucherer is Europe’s equivalent of “Tiffany’s in the U.S. and sells high end jewelry and watches. 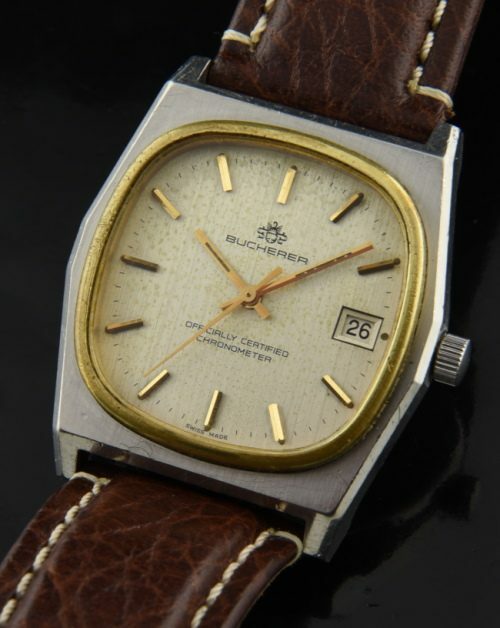 This is a high quality vintage watch that you can wear for a lifetime-at a great price!